Folks – I received this email yesterday and thought I would pass it along. Suzy Barile, descendant of Buncombe Co. native David Swain, will talk about her new book, Undaunted Heart: the True Story of a Southern Belle & a Yankee General at Malaprop’s Bookstore in Asheville, next Friday, Nov. 6 @ 7pm. It’s the story of Ella Swain, daughter of former NC governor and UNC president David Swain, who fell in love with and married the Union general whose troops occupied Chapel Hill at the end of the Civil War. Based on family letters, the book chronicles the challenges of rebuilding lives after the Civil War and the social history of the era. Please help spread the word about this event. We had a great time last night in Bakersville at our Mitchell County and the Civil War discussion. For those in the area, we are doing a similar program in Avery County on November 10 – 6:30 pm at the library in Newland. One of our visitors last night brought up some questions about iron mines in the Confederacy during the war. Our friend believed that Cranberry ranked second behind the mines in Birmingham, Alabama, for production of iron ore during the war. From my research, I know that iron ore was mined in Cranberry during the war, but only on a small scale, the problem of transportation keeping it from being more productive. According to the family who operated the mine during the war, only one wagon load of ingots was transported a month to the railhead near Morganton. So, this led me a round of research this morning into iron mines in North Carolina during the war. At the start of the war, there were more than 100 iron furnaces and bloomeries in the South. John A. Allen plantation near Mocksville. Davidson River Iron Works – Henderson County. So which ones were the largest? I’m not sure. 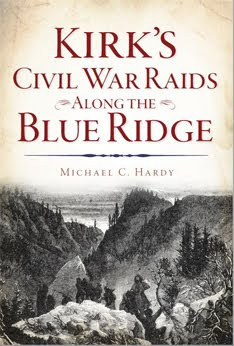 I do know that the Bloomery Mine and the Ore Hill Mine were Confederate operations, meaning, they were run by the Confederate government to some extent. In October 1861, the Fayetteville Observer reported that the Ore Hill Mine was producing 15 tons per week. In 1857, the Cranberry Mines were producing 17 tons a year. Just another forgotten aspect of a very large conflict. Yes, I know, I just did this recently, but several things have come up that you might be interested in. There will be a Mitchell County and the Civil War Round Table tonight at the Masonic Lodge in Bakersville. Starts at 6:30 pm and everyone is invited to attend. There is some information on the Cape Lookout Lighthouse in a magazine called Sport Fishing. You can check it out here. 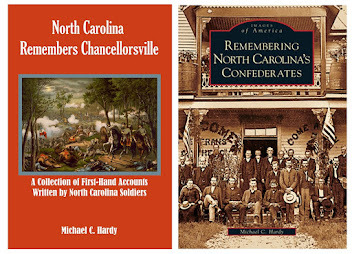 Information about a Tar Heel soldier who served in the 25th NCT and who might have owned a Henry rifle can be found here. Zeb Vance gets a mention in a article about the Tenth Amendment, which you can read here. 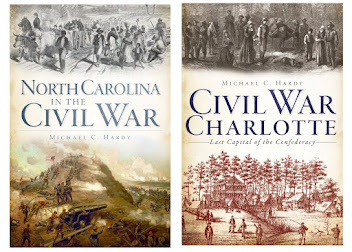 The Gaston Gazette reports on the activities of writer and historian Mark Hughes, who has put together “The New Civil War Handbook.” Check it out here. There is a upcoming living history at the site of the Fayetteville Arsenal this weekend. Learn more about the Arsenal and the event by clicking here. This past weekend, there was a memorial service honoring Maj. James Riley, the officer who surrendered Fort Fisher. Check it out here. 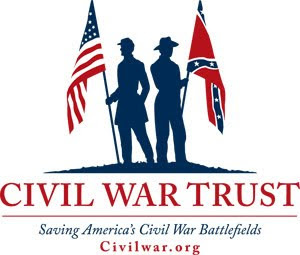 Andrew Duppstadt has more information on his blog, Civil War Navy, which you can find here. 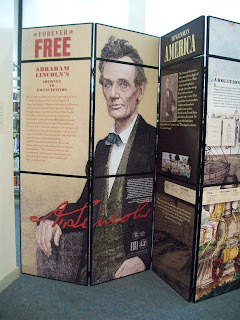 On Wednesday, I was in Asheville and stopped by Pack Memorial Library to view the current Lincoln exhibit. Interestingly, I would never call myself a Lincoln scholar, and at times, I am even a Lincoln detractor. That being said, I worked through Lincoln’s papers while working on the Hanover Court House book, and I’ve been to the Lincoln Museum and Library In Springfield while working on another project. Besides the standard traveling exhibit, the library had pulled some of its own items out of its collections and placed them on exhibit. These include oil paintings of Lee and Vance, a pre-war painting of Asheville, and a couple of items from UCV reunions in Asheville after the war. There was also some information regarding the battle of Asheville fought at the end of the war. There was an attempt to focus a little more on slavery locally. Someone had gone through local newspapers and printed out advertisements regarding slave sales and rewards for runaway slaves and placed them in notebooks on a table. The book also mentions the activities of people of color in the local newspaper continuing into the decade after the war. I would have liked to have seen more information about local slaves: how did the lives of mountain slaves differ from the lives of enslaved people in the deep South or along the coastal plain? How about a map showing some of the larger plantations in Buncombe County? Or, There are stories here in my section of western North Carolina of slaves who refused to leave their homes after the end of the war. Are there such stories in Buncombe County? Where there any enslaved men who stole away and joined the Federal army, serving in one of the many black regiments? I also did not see any mention of Sarah Gudger, a Buncombe County slave who was interviewed in the 1930s as a part of what is now known as the Slave Narratives. Maybe I just missed it, but here was a great example of what life was like for someone who lived through being a slave in Bumcombe County. Had I been putting this exhibit together, I would have attempted to find some way to bring this to light. The exhibit runs through the end of the month. If you are in Asheville, stop by Pack Memorial Library and check it out. Is it that time again? Time for look around of mentions of North Carolina and War in the press? I hope you enjoy. Rob Neufeld writes in the Asheville Citizen about the need for more historical markers, including one commemorating the battle of Deep Creek. Check it out here. The Garner News has an article that traces the history of the name of the community of Furquary-Varina, including some War-time stories. Check it out here. Famed historian Edwin Bearss will be speaking at a fundraiser in Rose Hill, North Carolina, in November. Get more information here. Great article in the Star News on Confederate place-names in Wilmington. Check it out here. 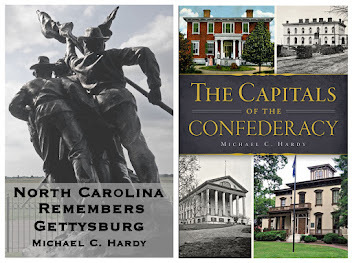 There are a whole slew of Civil War related programs going on at the public library in New Bern. Learn more about their programs here. 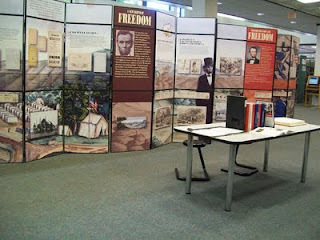 There is a exhibit on the life of Lincoln currently being held at Pack Memorial Library in Asheville. Follow this link for more information. 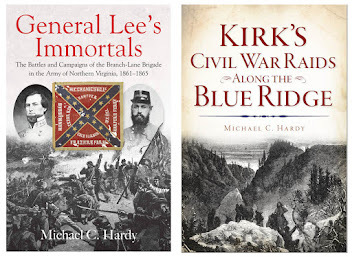 I should have mentioned this earlier – Fred Ray, author of Shock Troops of the Confederacy: The Sharpshooter Battalions in the Army of Northern Virginia, will be speaking tonight in Burnsville, North Carolina, at the Town Center at 6:30 pm. It has been a very, very busy past two months that have been filled with living histories, Civil War round tables, and other programs. 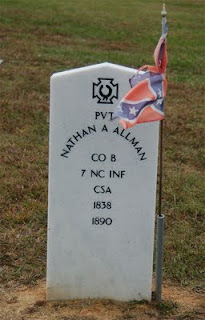 Yesterday, I spoke at a reunion of descendants of Nathan Allman, Co. B, 7th NCST. The reunion was held in Enochville, NC, over near Mooresville. It was my first trip to Enochville. Born in Cabarrus County where he resided as a farmer prior to enlisting in Cabarrus County at the age of 22, July 2, 1861, for the war. Present or accounted for until wounded in the leg at Gettysburg, Pennsylvania, July 3, 1863. Company muster rolls indicate he was absent wounded through November, 1864. North Carolina pension records indicate that he “died at home from blood poison.” Date of Death not reported. Then there are those two little sentences at the end: “North Carolina pension records indicated that he “died at home from blood poison.” Date of Death not reported.” Well, that is true. According to the fam ily, Allman was out plowing his field, and had a nail from his boot puncture the bottom of his foot, which caused his death some weeks later. The way the listing reads, this occurred during the war. It did not. Allman died in 1890. I’m not quite sure where the great folks in Raleigh came up with their entry for Allman. There is a lot more information in his record. Allman is buried in the St. Enoch Cemetery in Enochville. 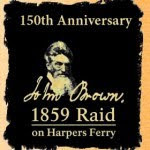 There seems to be a lot of John Brown in the news today – and since we sit on the edge of the 150th anniversary of the event, I thought maybe we should get back to our discussion. My apologizes for not getting this finished – something else stepped up and took its place on my importance list. A recap – we’ve had a very good discussion on John Brown and his role in American history: was he a political activist, or was he a terrorist? I even placed an impromptu poll up on the blog, asking you what you thought. In this unscientific poll, most of you thought he was a terrorist. However, given that the majority of my readers are Southerners, that should be no surprise. Next, we looked at North Carolina’s reaction to John Brown’s Raid. Since the A. P. wire did not exist, local newspapers were forced to reprint what had appeared in other newspapers. Their own thoughts were often limited. Through the newspapers we examined, we find both disdain for the political party thought to have backed the attack (the “black Republicans”), and warnings regarding suspicious characters in local communities. There were even a few references to men being detained and tried. I was going to post next on the ties of North Carolina to the Raiders, namely that John A. Copeland, Jr., and Lewis S. Leary were both born free persons of color in North Carolina. Josh Howard did a good job with that, and if you have not yet seen it, you can read his article here. As I sit and write this morning, a thought kind of sticks out above the others: just how is John Brown being taught in schools across North Carolina this week? Is he getting a mention at all? Or, are the upcoming dates just going to be something else that goes by largely unnoticed like so many of the others? Granted, it has been a while since I was in school (junior-senior high, at least). And while I do not really remember what the text said, I do remember the illustration. It was the one that I posted on the original John Brown post. Ok, I took a break yesterday from writing this and did another informal survey. I posted a query on both my facebook and myspace accounts, asking people who were educators, students, or parents of students, if their schools were doing anything regarding the 150th anniversary of John Brown’s Raid. To say that the response was underwhelming would be an overstatement. For the few folks that did comment back, they knew of nothing going on at their schools. So I want to propose this question: it the larger scheme of things, has John Brown been forgotten? Will there be anything in local newspapers this week to commemorate the event? Or, will there be any discourse at the local library, local community college, or public university about Brown’s role in history? Or, has the matter largely been replaced by other events? Probably not a fair question for a blog that deals with that period of history. We here all remember the actions of Brown, some of us with pride, some with disdain and contempt. I guess I should apologize. I could (and probably should have) put together a program that examined the life of John Brown in one of two of the local venues that I mentioned above and I did not. The work on the 58th NCT book kept me distracted. I am going to start work today on some programs that look at the war itself and make sure those years are not forgotten. Well, it was a rather exciting weekend. On Friday, I was speaking at the Friendship Luncheon of the North Carolina Division of the United Daughters of the Confederacy in Fayetteville. This was their annual meeting, and I was speaking on the importance of remembering the common soldier. After I finished speaking, they presented me with the Jefferson Davis Historical Gold Medal for my book, Remembering North Carolina’s Confederates. The Medal is presented for “furthering the study and preservation of Confederate history…” I am honored and would like to thank the wonderful ladies of the North Carolina Division of the United Daughters of the Confederacy for this unexpected reward. 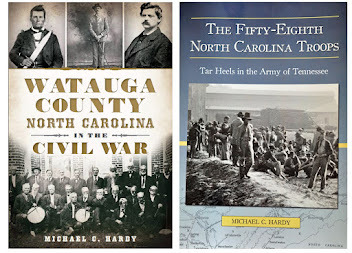 But that is not all, the North Carolina Society of Historians recently saw fit to honor two of my local history books with their Willie Parker Peace History Book Award. This makes the fifth and sixth times that I have won this award. The books for which I won this year are Families, Friends, and Felons: Growing Up in the Avery County Jail, co-authored with Jimmie Daniels; and Images of America: Mitchell County. Once again, I am truly honored. So what’s next? I am going to work on trying to get my email caught up, and we are going to work on expanding the shelving on in our library this week. Interestingly, when I talk about moving our books around, everyone I know sort of seems to disappear until I announce that I’ve finished. Rob Neufeld writes an interesting article about a member of the 60th North Carolina Troops in the Asheville Citizen. Check it out here. There is a living history at the Bennett Place this weekend – more information can be found here. Interesting article on Maj. Charles M. Stedman in the Politico a couple of weeks ago. Check it out here. On Ancestorymagazine.com there is an article on Pvt. Durham H. Smith (31st NCT). Check it out here. Do you hear angels singing? About 11:30 last night, I finished the 58th NCT manuscript. The photos are in order, captions written and proofed, maps are finished, map captions are finished, the whole thing (manuscript, photos, maps, and captions), is printed out, cover letter written, and everything burned on disk. It is sitting here on my desk waiting for the post office to open. 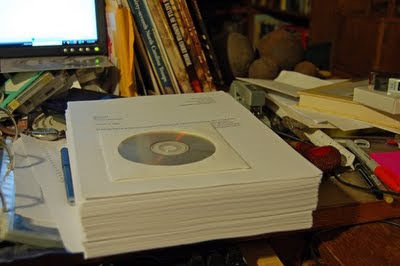 The manuscript is 128,379 words in length (393 pages), with 95 photographs (had to cut some), and sixteen maps. I’ve been writing about three years – not three straight years, but three years. I started collecting information about eleven years ago, when I started working on my history of the 37th NCT. I have talked to hundreds of descendants along the way. One of my readers said that he believed that this was my best book yet. I hope so, and I hope, when it comes out sometime next year, that you will agree. I believe that I have written this before (but I am too tired to go and look), that writing regimental histories (in my opinion), is one of the hardest things to do. This is my second. 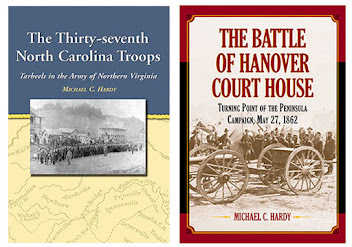 I have written many other things – battle histories (Hanover Court House and the Brooksville Raid), county histories (Watauga and Avery), pictorial histories (Avery, Caldwell, McDowell, and Confederate Veterans), and several magazine articles including a couple of bios, and nothing compares to the work of a regimental history. You can be the master of a battlefield – you can crawl over every inch of it, and read scores of letters and reports that describe the actions that took place. To write about a regiment, not only must you know how a regiment worked, but you must know about every battle it fought. For both the book on the 37th NCT and the forthcoming book on the 58th NCT, I have tried to walk over every place they fought, and a few places that they camped. This was a little harder for the 58th NCT, considering that most ofthe battlefields in Atlanta are gone! But I’ve tried. The 58th NCT has been a much more challenging task that the 37th NCT. The primary sources are not what I would like (no 58th NCT records after August 1864), and the secondary sources are not that good. Several good histories of the overall campaigns, but nothing like Rhea’s Overland Campaign books. When I wrote the book on the 37th NCT, the only thing that I felt that I really need a good book about was the battle of Hanover Court House (Slash Church). So I took my research, dug deeper, and wrote a well-received book about the battle. I could spend the rest of my writing career looking into some of the holes in the scholarship in the western theater of the war. The above picture I took this morning. That is the 58th NCT manuscript lying on my very untidy desk, waiting for the post office to open. We’ll continue our look at a few soldier’s graves as I work on finishing the 58th NCT manuscript. 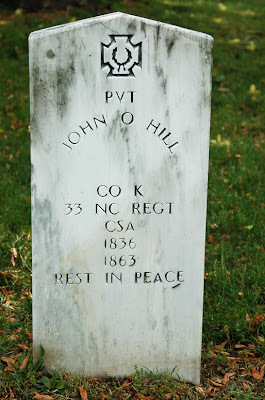 John O. Hill was a private in Company K, 33rd North Carolina Troops. He enlisted in Greene County in January 23, 1862. Two months later, he was captured during the battle of New Bern. Hill was released in August and returned to duty in November. He was wounded in the fight at Chancellorsville in May 1863, and died at a hospital in Richmond, Virginia, of wounds and/or “erysipelas.” He is buried in the Confederate section of Hollywood Cemetery.